This is the twenty sixth in a series which introduces and describes the various dive services and sites for worldwide liveaboard dive safaris. 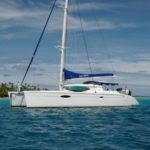 The focus in this one is on French Polynesia liveaboards. Tahiti and French Polynesia first came into my awareness in any detail with the reading of Somerset Maugham’s The Moon and Sixpence, the fictionalized account of the life of Paul Gauguin, the impressionist artist, who made his escape from the humdrum to be truly inspired by the colors and beauty of pacific island life. It struck me then, as now, as perhaps the most remote location in the world. In fact, the location about halfway between South America and Australia makes it that. Today its 118 islands spread over 1,200 miles (2,000 km) have a population of 276,000 who are located in a few cities and small villages, with 67 islands uninhabited. There are less than a dozen local dive shops and only two liveboards servicing the area. The lack of traffic and low population has left the undersea world in great condition, with pristine reefs, great biodiversity and a fantastic array of big fish and mammals. Major attractions include grey, whitetip and blacktip reef sharks, tiger and silky sharks, manta, eagle and sting rays, tuna, barracuda, big-eye jacks, dolphins, humpback whales and green and hawksbill turtles. Macro life is great and there are several outstanding wrecks like Les Trois Epaves off of Tahiti. Take a look at the videos to get a concrete demonstration of the richness of the wildlife. There is a full range of undersea terrain: shallow coral gardens, steep walls, caverns and swim-throughs, channels and wrecks. In addition, there can be significant drift. For this reason the diving is suitable for experienced divers. 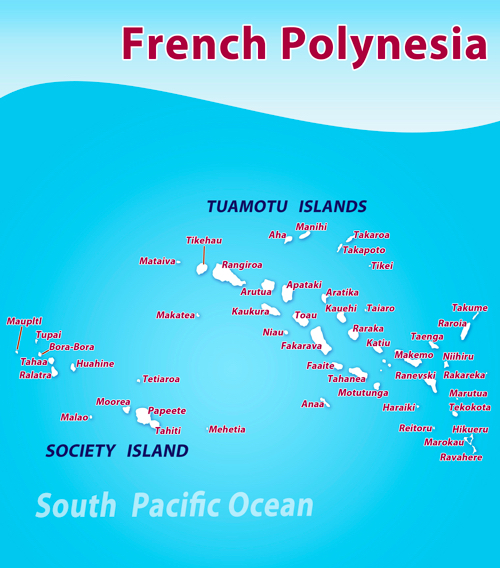 In addition, French Polynesia enforces regulations regarding diving depth, which operators follow. Maximum depth for Open Water Divers is 18m (60ft). For Advanced Open Water and Rescue Divers the limit is 29m (97ft). If you are a Master Scuba Diver, or the equivalent, 40m (130ft) is acceptable. The two liveaboards offer the Advanced Open Water course and some others, on request. Diving is possible year round and cyclones and typhoons don’t pose a threat. There is a wet season from November through April. Plankton is more prevalent during this time, which does attract feeders. November is the best time for whale sightings. The peak season for diving is when it is dry from May through October. It is warm all the time with a narrow range in water temperature from 26-28°C (79-82.5°F) and visibility is great. 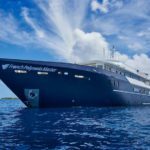 There are only the two liveaboard dive boats offering safaris in French Polynesia. 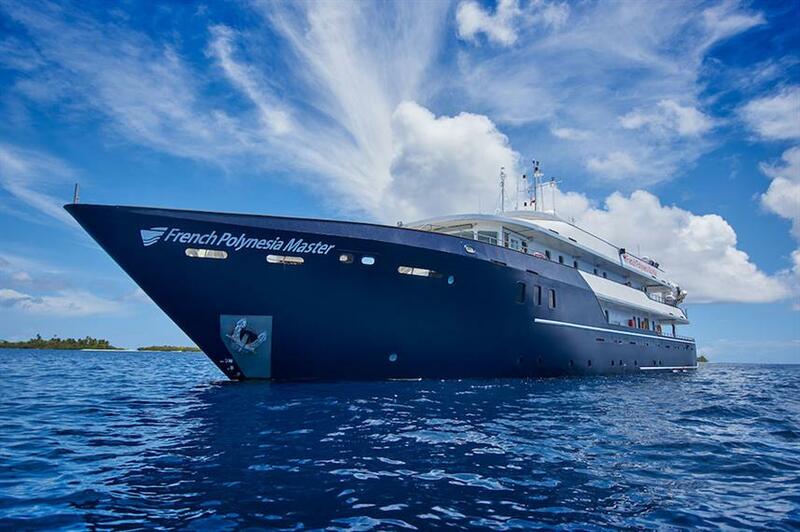 The French Polynesia Master is more of a classic, mid-size liveaboard yacht. It has a large range, traveling to three relatively distant islands covering many sites along the way. The facilities are extensive, modern and roomy at a luxury level, with quality French cuisine. 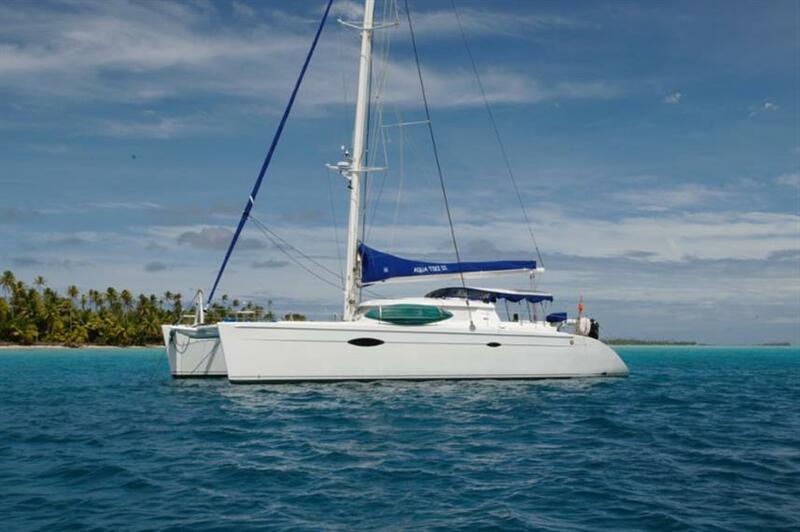 The Aqua Tiki II is a fantastic catamaran catering to small groups. There is an economy of space and less range than the FPM, focusing on dive sites around Fakarava. They do offer a more personalized service and potential camaraderie and the excitement of cruising on such a craft. My partner and I have been tossing about the idea of including a dive cruise on our next holiday and the French Polynesia Master looks like our sort of ship. While he dives I am the one left snorkelling across the top so it was refreshing to see that us non-divers are also catered for. He has been keen to get up close to manta rays so maybe this is the opportunity. We are not party people as such and I just wondered how many people are catered for on any one trip? We are after a relaxed time onboard, obviously happy to mingle with others but not really looking for lots of late night party’s or lots of noise. Your thoughts appreciated. Thanks for your comments and question. This liveaboard is indeed a good opportunity to see mantas. You, as a snorkeler, also have a good chance of swimming with dolphins, whales, turtles, blacktip reef sharks and lots of fish. The French Polynesia Master carries up to 25 guests. That is a fair number, but it is a 42.6 meter vessel. It is pretty roomy as yachts go. People on such trips are usually pretty conscious of people and their space. Frankly, this one is pretty expensive and a long trip to get to. People going are more likely to be on the mature end of the spectrum. In any case, you can make your concerns and priorities known to the captain and he will do his best to give you the kind of environment you would like. If you have any further questions, please get in touch. I also invite you to look at some of the other liveaboards I review. There are boats catering to smaller groups and in similarly exciting diving environments that you might consider. I’m not going to lie, I have never dived a day in my life other than in a few swimming pools. This and parachuting are on my bucket list. These dive sites look absolutely beautiful and a dream vacation. I honestly don’t know if I would ever be able to take a vacation like this. I just wanted to say that with your words and pictures and videos you brought this adventure to real life for me. Thank you for doing that. Its a testament to the website. Thanks a lot for your kind words. I’m glad you enjoyed my post. It would be great if you could learn to dive and have a chance to see the undersea world in a place like French Polynesia.The basic open water diver class takes about 4 days and includes some study, 5 shallow water classes to learn the skills and 4 open water dives to practice the skills and have a supervised introduction to the undersea world. You can take a class like this in many places. There is probably someplace close to where you live. If you would like some help to find a good spot for you to do it, please let me know. I’d love to see you get started. Getting my diving certification has been on my bucket list for way too long! I’ve heard about the beauty of French Polynesia for a long time. As pristine reefs are dwindling with climate change, natural and unnatural disasters its so important to protect these gifts of the planet. You certainly gave me a proverbial ‘kick in the pants’ to get certified again. Before coming across your article it never dawned on me that I could make an entire vacation out of the adventure of getting my diving license. I researched the prospect of at least getting my newbie training when I was last in the Yucatan Peninsula but, I was worried about the safety levels of instructors that weren’t providing a lot of information. This is a cruise I would be over-the-moon to take! Thank you for rekindling my passion to explore. A liveaboard certification experience is a huge step up from my original plan and I never would have even known that this type of mega adventurer trip was available if I hadn’t found you! Thanks a lot for your kind comments. Diving in the fabulous undersea environment of French Polynesia is a bucket list kind of event. I do have disappointing news for you. As indicated in the post, because of significant currents the diving there is not suitable for beginners. The two liveaboards offer the advanced open water course. This is for divers who have already done the initial course. As I say to Dale in my response to his comments above, the basic open water diver class takes about 4 days and includes some study, 5 shallow water classes to learn the skills and 4 open water dives to practice the skills and have a supervised introduction to the undersea world. You can take a class like this in many places including a great many of the resorts and liveaboards that I review here on my site. I suggest you browse the different locations and see if there are any that attract you. If you would like some help to find a good spot for you to do it, please let me know. 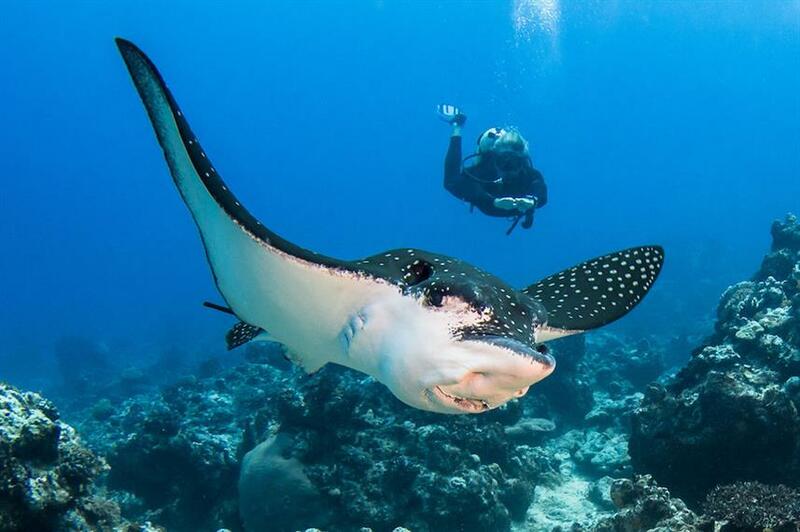 After earning the open water certificate, you would be eligible to do the liveaboard diving in French Polynesia. I hope you get a chance to do it. I did some diving when I was in Hawaii last year and completely fell in love with it. I have been looking for my next place to go and these islands look great. I especially like that since the traffic is low everything is still in great condition. Now it’s time to research how much it would cost to get there from the US. Thanks for your comments. French Polynesia really does look like a low traffic, very pristine area to dive, with lots of opportunities to see big fish and mammals. Good luck finding reasonably priced transportation getting you there. If you have any questions or need any help with logistics, please let me know.